Dental implants are titanium tooth roots that are surgically placed by a cosmetic dentist in order to secure permanent replacement teeth. These are employed when a whole tooth is missing or removed. We can also install dental implants in order to support bridges and dentures. A dental implant allows for the restoration of full tooth function and appearance. Dental implants are a widely available solution for patients in Eagan, though it is necessary for the patient to have healthy gums and enough bone available to anchor the implant. 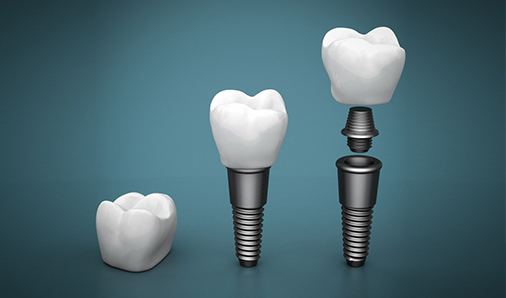 WHY SHOULD YOU CONSIDER A DENTAL IMPLANT VERSUS A BRIDGE OR DENTURES? Better function – Dental implants can help improve speech as well as allow the dental patient to eat with less difficulty and more comfort, especially when utilized with dentures. Higher confidence –Enjoy a full, healthy-looking smile and its positive impact on your self-esteem in social situations. Durability –Dental implants are incredibly durable and can last a lifetime if properly cared for. Convenience – Implants eliminate the need for the involved upkeep that other options such as dentures or dental bridges require. Dental implants are also incredibly reliable and can last a lifetime if properly cared for. Have further questions about dental implants? We’re here to help! Contact us today to set up an appointment with our cosmetic dentists in Eagan!